One of the central challenges in understanding pro-environmental behavior is measurement. Currently, most researchers (including myself) lean on self-report of behavior. I'm looking for a brainstorm. What kinds of pro-environmental behaviors might be realistically measured by researchers? I think there's room for more creativity. I'd love to hear some ideas. For example, recycling bins have been measured at the curb for weight (time-consuming), electrical meters have been read by students (time-consuming), household water usage has been measured by partnering with a water district (long-term negotiation due to privacy).... there are also laboratory tasks such as recycling, donation, and turning out the lights, but these are lower-quality measures because they only occur once. There's room here for more creativity. What other pro- or anti-environmental behaviors can be observed by researchers in the real world or in an online survey? I'm looking for a brainstorm, not a literature review. I work in this area and know the key papers well. Thank you for any suggestions! This chapter provides an overview of pro-environmental behaviors (PEBs). There is no catchall definition or way to categorize PEBs; therefore, I propose various definitions and ways to categorize PEBs. Two main definitions for PEBs are shown here: purpose oriented and fact oriented. 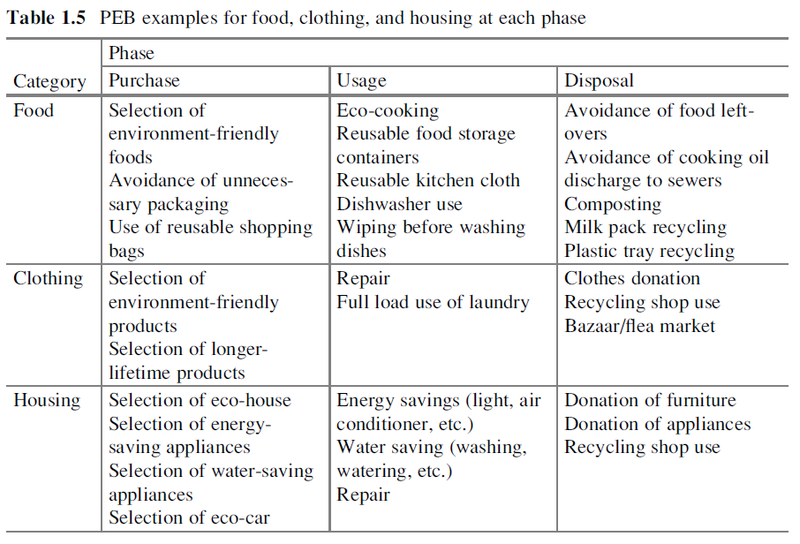 [...] I summarize behaviors proposed by various environmental agencies and present a list of 200 PEBs. In the list, the main classification is based on the major targets for reduction, such as greenhouse gases, air pollutants, water pollutants, resource consumption, and disturbance of nature, with 12 categories under the main targets, which are standard in many places. Alas Kurisu doesn't have a chapter on objective measures (only has one on subjective surveys and one on [objective] life-cycle assessment). Do self-reports match objective behavior? We performed a meta-analysis to quantify the association between self-reported and objective measures of proenvironmental behavior, and to evaluate the moderating influence of two socio-demographic and seven methodological moderators. Data from 6260 individuals or households, involving 19 measures of association in 15 studies, revealed a positive and nominally large (Cohen, 1988) effect size (r = .46). However, this means that 79% of the variance in the association between self-reported and objective behavior remains unexplained, which is especially troubling given the environmental context. We conclude that although this effect size is conventionally large, it is functionally small for testing theory and devising intervention campaigns, possibly leading researchers to draw misleading conclusions about the usefulness of theories that employ self-reports to predict objective behavior. These findings highlight a crucial need for research that strengthens the validity of self-reports for well-defined types of environmental behavior. What could be useful from this paper is its list of studies that have performed actual PEB measurements (see their table 1). Alas this isn't too encouraging or creative; there are only two dozen studies or so in that table, and most measured stuff that's easy to measure: energy usage or recycling behavior. Of these, Kaiser (2001) probably has the most extensive list in a single study, with 14 PEBs. Not the answer you're looking for? Browse other questions tagged social-psychology measurement experimental-psychology psychology survey or ask your own question. Are cortisol measures more reliable than self-reported fear measures for looking at difference scores?